Compound eyes are typically classified as either apposition eyes, which form multiple inverted images, or superposition eyes, which form a single erect image. Apposition eyes can be divided into two groups. The typical apposition eye has a lens focusing light from one direction on the rhabdom, while light from other directions is absorbed by the dark wall of the ommatidium. The mantis shrimp is the most advanced example of an animal with this type of eye. In the other kind of apposition eye, found in the Strepsiptera, each lens forms an image, and the images are combined in the brain. This is called the schizochroal compound eye or the neural superposition eye (which, despite its name, is a form of the apposition eye). Good fliers like flies or honey bees, or prey-catching insects like praying mantis or dragonflies, have specialized zones of ommatidia organized into a fovea area which gives acute vision. In the acute zone the eye is flattened and the facets larger. The flattening allows more ommatidia to receive light from a spot and therefore higher resolution. There are some exceptions from the types mentioned above. Some insects have a so-called single lens compound eye, a transitional type which is something between a superposition type of the multi-lens compound eye and the single lens eye found in animals with simple eyes. Then there is the mysid shrimp, Dioptromysis paucispinosa. The shrimp has an eye of the refracting superposition type, in the rear behind this in each eye there is a single large facet that is three times in diameter the others in the eye and behind this is an enlarged crystalline cone. This projects an upright image on a specialized retina. 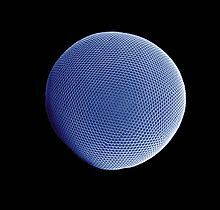 The resulting eye is a mixture of a simple eye within a compound eye. The body of Ophiocoma wendtii, a type of brittle star, was previously thought to be covered with ommatidia, turning its whole skin into a compound eye. Asymmetries in compound eyes may be associated with asymmetries in behaviour. For example, Temnothorax albipennis ant scouts show behavioural lateralization when exploring unknown nest sites, showing a population-level bias to prefer left turns. One possible reason for this is that its environment is partly maze-like and consistently turning in one direction is a good way to search and exit mazes without getting lost. This turning bias is correlated with slight asymmetries in the ants' compound eyes (differential ommatidia count). ^ "Senses. Insect eyes". Insects and Spiders of the World. Volume 8: Scorpion fly - Stinkbug. New York: Marshall Cavendish. 2003. p. 459. ISBN 978-0761473428. ^ Völkel, R.; Eisner, M.; Weible, K.J. (June 2003). "Miniaturized imaging systems" (PDF). Microelectronic Engineering. 67-68 (8): 461–472. Bibcode:2011MiEng..88.2205A. doi:10.1016/S0167-9317(03)00102-3. Archived from the original (PDF) on 2008-10-01. ^ Hunt ER, et al. (2014). "Ants show a leftward turning bias when exploring unknown nest sites". Biology Letters. 10 (12): 20140945. doi:10.1098/rsbl.2014.0945. PMC 4298197. PMID 25540159. ^ Hunt ER, et al. (11 April 2018). "Asymmetric ommatidia count and behavioural lateralization in the ant Temnothorax albipennis". Scientific Reports. 8 (1): 5825. Bibcode:2018NatSR...8.5825H. doi:10.1038/s41598-018-23652-4. PMC 5895843. PMID 29643429. Wikimedia Commons has media related to Compound eye. Did you know that shrimps blink?